What Gov. Charlie Crist failed to acknowledge in his despicable demagoguery against ideology is that he is in fact advancing a different sort of ideology—pragmatism. The irony is, especially as it relates to Crist’s aggressive promotion of expanded gambling to help balance the state’s budget, the governor is advancing a pragmatism that, in fact, will not work. Worse than that, Crist, who campaigned in 2006 as an opponent of gambling expansion, is advancing a pragmatism that will harm the citizens he’s obligated to protect. Claiming he is not a “big fan of gambling,” Crist told legislators they should approve a gambling compact with the Seminole Indian Tribe for the sake of the education of our children. Yet again trotting out freckled-faced kids as a cover for gambling expansion—that’s despicable demagoguery. There is much that is wrong about Crist’s argument for gambling expansion, but I’ll focus on just two points: fiscal and moral. In my last editorial, I reviewed the independent research of Dr. Earl Grinols, who testified last year before the House Select Committee on Seminole Compact Review. The bottom line of his research is that casino gambling doesn’t pass the cost-benefit test. For every one dollar of new government revenue generated by casino gambling, the government is required to spend three dollars for the social costs that gambling causes. 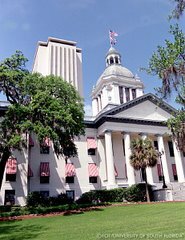 Crist wants legislators to bank this year $430 million the Seminoles have been escrowing based on the first compact negotiated with the governor in 2007 but invalidated by the Florida Supreme Court in 2008. If Grinols is correct—and he’s got both an impressive body of research and impressive academic resume to back it up—the penny-wise “solution” of taking Seminole gambling money in 2010 will later result in the pound-foolish costs to the state in a few short years. What kind of problem-solving is that? Even though (thankfully) Crist and some of the legislators will not be around to deal with the consequences later, they are duty-bound to not create an even greater fiscal nightmare in the future by approving an gambling expansion today. The fiscal facts alone should cause legislators to reject gambling expansion. However, there is a moral argument that cannot be ignored. That’s right; I’m making an ideological argument against gambling. Crist’s desire to allow Floridians the opportunity to “exercise their freedom in a way that directs money to Florida’s citizens” is incredibly cynical. What the governor is really saying is that public officials whose duty it is to protect citizens should instead prey upon the most vulnerable—the poor and those subject to addictions—and rely upon making them losers to fund the state budget. Indeed, it is immoral for the government to make citizens losers to balance the budget. This is just plain wrong—and any public official who claims to be concerned for the family cannot support it. Charlie Crist’s pro-gambling colors have been clear for all to see since at least 2007. As outrageous and irresponsible is the governor’s gambling rhetoric and actions, those who are concerned about gambling expansion in the Sunshine State should be more troubled by the talk of a grand gambling compromise coming from within the once anti-gambling Florida House of Representatives. It appears the governor’s non-stop push for gambling that began early in his gubernatorial term and the daunting fiscal challenge of balancing the state budget in the midst of the Great Recession may cause legislators to succumb to the lie that gambling money will fix our problems. According to Mary Ellen Klas of The Miami Herald, the framework of a gambling compromise negotiated between the Seminoles and House leaders is in the works. According to Klas, the compromise would include a $150 million annual payment from the tribe for five years and exclusive operation of table games in South Florida. If the Legislature later gives blackjack and table games to the pari-mutuels, the Seminoles would pay only for the operation of its slot machines for 20 years—and those payments would end if pari-mutuels outside of South Florida later are given video lottery terminals. Klas also reports the deal with the Seminoles would be tied to a bill to lower the tax rate for pari-mutuels. It’s interesting—and disturbing—that the pari-mutuels expansion bill will once again be packaged with the prospective Seminole compact after the two measures were de-linked when the House Select Committee rejected the compact and approved the pari-mutuels bill in January. Tragically, there are some legislators who have an otherwise strong record on pro-family matters who may vote for a prospective gambling compromise—even in the face of the clear evidence that gambling destroys families, and it results in the loss of human life. Legislators who support gambling expansion are not pro-family and they are not pro-life. Ideology in the defense of families and life should be preferred to pragmatism and problem-solving that actually exacerbates our state’s problems.